Former Wall Street economist Henry Kaufman (RW note: Back in the day, he really could move bond markets) spoke before an audience of about 200 during an appearance at The Society of the Four Arts on Monday in Palm Beach. He told the group that he would rather buy tulips than bitcoin. The tulip mention is, of course, a sly reference to the tulip bulb speculative bubble that swept the Netherlands in the 1630s. Kaufman, 90, now lives in Palm Beach. After the discussion, Kaufman signed copies of his latest book, Tectonic Shifts in Financial Markets. In this wide-ranging book, Wall Street legend Henry Kaufman recounts the events surrounding the catastrophic collapse of Lehman Brothers from his then vantage point on the board. He explains how, ironically, the Federal Reserve’s shortcomings contributed to its growing power. And he argues that Dodd-Frank – by sanctioning rather than truly addressing the too‐big‐to‐fail dilemma – squandered a rare opportunity for essential reform. 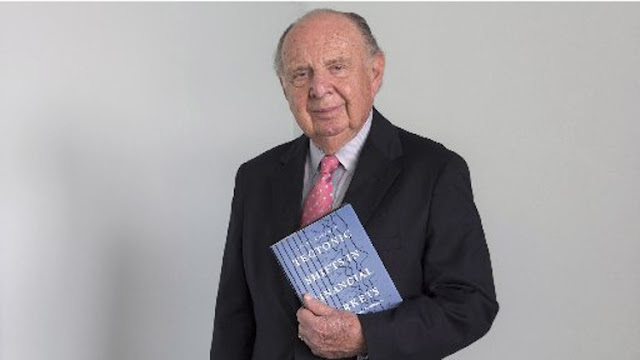 Whether sparring in print with Citicorp’s mercurial Walter Wriston, consulting with British Prime Minister Margaret Thatcher, spurning a deal with junk bond king Michael Milken, or reflecting on his long-time friend Paul Volcker, Kaufman brings readers inside post-war Wall Street. Looking ahead, he dissects major national and global trends and the likely future of credit markets, financial institutions, and leading economies. As we search for bearings in the wake of the 2008 financial debacle, Henry Kaufman offers sage and penetrating analysis of today’s superheated and – he argues – still‐fragile financial world.